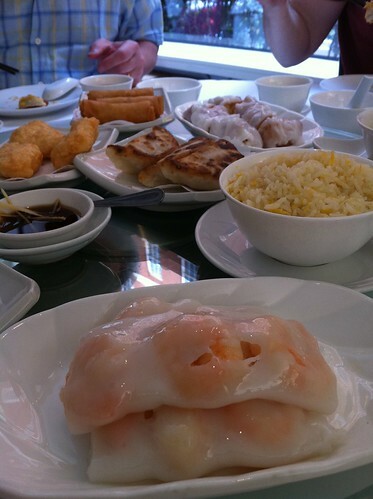 One of the goals that I once aspired to is to eat as much dim sum in my life as is physically possibly. Fattening but ultimately quite rewarding, I am sure you will agree. Hopefully, after these endeavours, I would be in a position to learn the intricacies of the perfect dim sum brunch, but mainly to have some amazing eats, and to be fair, I'm not doing too badly. Having visited the same dim sum restaurant for nearly 20 years (the now rather disappointing New World in Chinatown), it shocked me at how much choice there was when I actually started looking. It's hard to move on when you have found somewhere which you find ticks almost all the boxes, Dragon Castle still remains a firm favourite, but it is far from perfect. During many online conversations, I have visited many, travelling as far as Camden (Yum Cha) and Earls Court (Dragon Palace) to consume dumplings. This may not seem far, but travelling anywhere on a weekend morning is a challenge at the best of times when you live in South London. Princess Garden was recommended by someone I respect very much, and until she stopped last year, Helen's blog was one I read without fail. 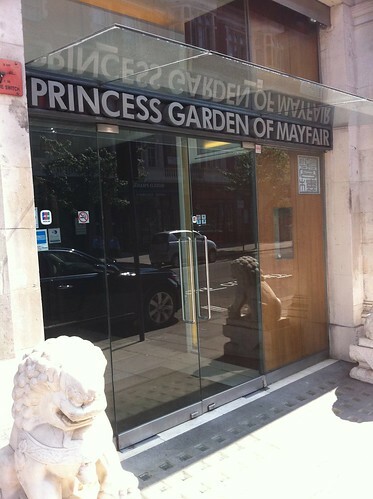 In a few discussions on twitter, one name kept coming up and that was Princess Garden, a dim sum restaurant buried deep in Mayfair. Don't let the location share you off, the prices at Princess Garden are very reasonable and are pretty closely aligned with what you would expect to pay. The food itself felt a bit lacklustre to me, and in the words of my travelling cousin, a little bland. Don't get me wrong, it was far from bad, but when you are eating fried things, and steamed things, you really want to be distinguishing flavours and more than just tepid. We did arrive just before a coachload of people turned up (5 whole massive tables, in and out under 30 mins), but still, I expected more. The dumplings were probably the highlight of the meal for me, with the scallop and prawn ones in particular, beautifully presented and delicately steamed. 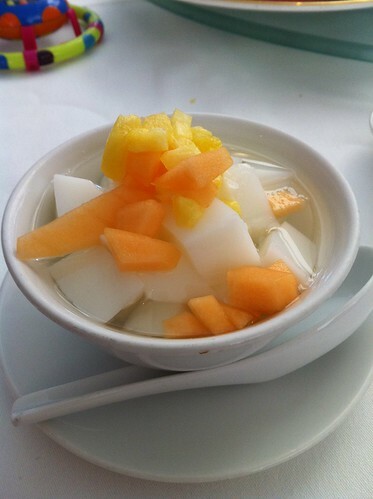 The thing which actually made me most excited was the choice of almond bean curd and fruit salad on the menu, something so simple, but something I will always have if it is on the menu. 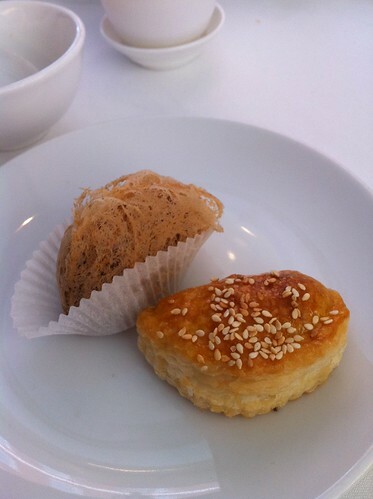 One common gripe, Dim Sum restaurants definitely do not have enough dessert choices on their menus. I thought Princess Garden was merely ok on this occasion. My dad, the man who is probably the hardest to please in the entire world thought it was ok, as did the rest of my family. I can't help feeling that I want more than mediocrity when I come to Mayfair for food. I guess the hunt goes on. A shame although the scallop dumpling does look nice. Have you been to either Pearl Liang or Phoenix Palace? I think they're a cut above most in London. Rather spookily, I'm off to Princess Garden for dinner next week! They must have had an off day... I tend to eat there at least once a week as it's close to work and I have not been let down by them! 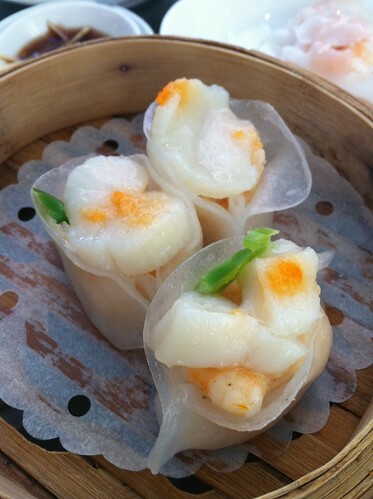 I could see from your photo that the Woo Kok/Yam Dumpling wasn't puffy enough. That tends to be my gold standard for Dim Sum! Sorry, I know I'm odd. Agree there never is a decent dessert selection. Mr Noodles - I'm with you on Pearl Liang. I actually enjoyed Plum Valley for something a little more contemporary too. I didn't get a chance to try Shanghai in Dalston, but a good foodie friend had these awesome dumplings there. Think I have the same goal as you! A shame this disappointed. @ Mr Noodles - I have been to Pearl Liang and definitely enjoy it there. Haven't heard of Pheonix Palace before and will check it out, thanks! @ Ming - I think the bus load of tourists definitely had something to do with it. Not bad, but I guess with all dim sum restaurants, you need to get in early. @ Hungry Female - I think the woo kok is a good standard, and all too often they are cooked in advance so they are lukewarm and stodgy. @ Ute - probably not :) I know that Helen likes it a lot so probably just a slightly off day. @ GC - An honorable aim.